What's the tolerances of the caps? 428 uF for a specified 470 uF is a deviation of 8.9%, well within the typical ±20% for electrolytic caps and also within the tighter ±10% tolerance that is offered for the better ones. Hi Ironsniper, welcome to the forum! A dedicated LCR meter (I haven't got the DER5000 but an Applent AT826, yet for practical applications they should be comparable) offers many parameters that may actually affect the measurement results. First of all, it's always a good idea to use kelvin (four-wire) probes to measure the voltage directly at the terminals of the DUT and eliminate the resitance of the probes/connections themselves. Moreover, the measurement frequency has a major effect on the results. Especially electrolytics will show a considerable dependency while small plastic foil (particularly polypropylene/polystyrene) caps are almost independant. In case of the electrolytic caps, the temperature of the DUT also may have considerable effect, though this affects more the ESR than capacity. Electrolytics are usually specified at 120Hz measurement frequency, so please make sure you select something in this range. Hi Ironsniper, welcome to the forum! A dedicated LCR meter (I haven't got the DER5000 but an Applent AT826, yet for practical applications they should be comparable) offers many parameters that may actaully affect the measurement results. First of all, it's always a good idea to use kelvin (four-wire) probes to measurent he voltage directly at the terminals of the DUT and eliminate the resitance of the probes/connections themselves. Moreover, the measurement frequency has a major effect on the results. Especially electrolytics will show a considerable dependecy while small plastic foil (especially polypropylene/polystyrene) caps are almost independant. In case of the electrolytic caps, the temperature of the DUT also may have considerable effect, though this affects more the ESR than capacity. Electrolytics are usually specified at 120Hz measurement frequency, so please make sure you select something in this range. just checked the frequency and it was not set correctly, i changed it to 120hz and now its reading like it should and my kelvin clip upgrade is working perfectly! thanks everyone! just checked the frequency and it was not set correctly, i changed it to 120hz and now its reading like it should and my kelvin clip upgrade is working perfectly! 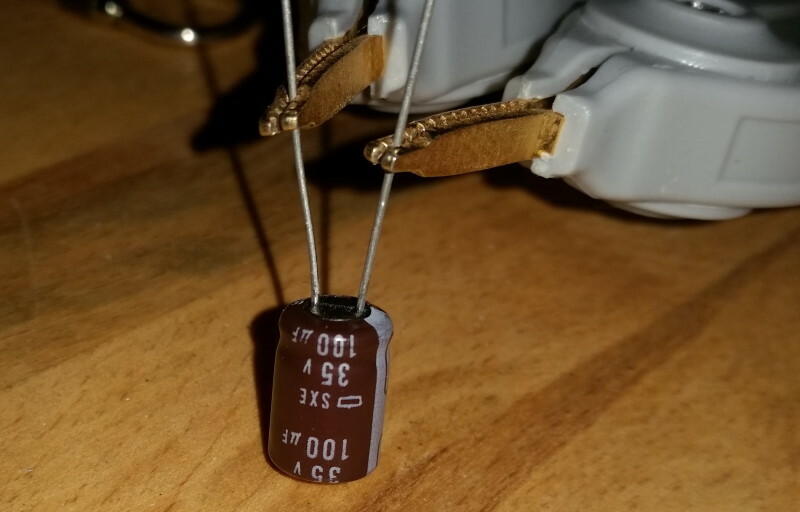 Yes, electrolytic capacitors often read VERY differently when tested at different frequencies. The displayed value goes up as you raise the test frequency. Enjoy the 5000; it's a useful tool. ... The displayed value goes up as you raise the test frequency. Really? I always found it to be the other way round, i.e. the higher the test frequency, the lower the measured capacitance will be. This also makes more sense from a theoretical point of view: Since some of the (AC) current flowing though an electrolytic capacitor is in forms of ion current, i.e. the physical movement of atoms (dissolved in the electrolyte), there will be some kind of "inertia" to put it simple and better imaginable. And this ion current won't follow the high frequency as easily as it will lower frequencies, hence the lower capacitance. Same here, go higher in measurement frequency results in a lower capacitance. Please note that the ESR on 120Hz is the highest and that is is much lower on higher frequenciies. Step 1. Get capacitor datasheet. Step 2. Read capacitor datasheet. Step 3. Measure with the signal's specification "according" to the datasheet.